Moored at Thrupp for a few days. Met up with Caz and Simon in Oxford, for a few beers and an excellent meal at Chutneys. Caught the bus back to Kidlington and set off walking back to the boat, asked directions from someone getting in a ca, who then kindly gave us a lift the rest of the way. Woke up this morning to find snow covering the ground, hard to believe in April. 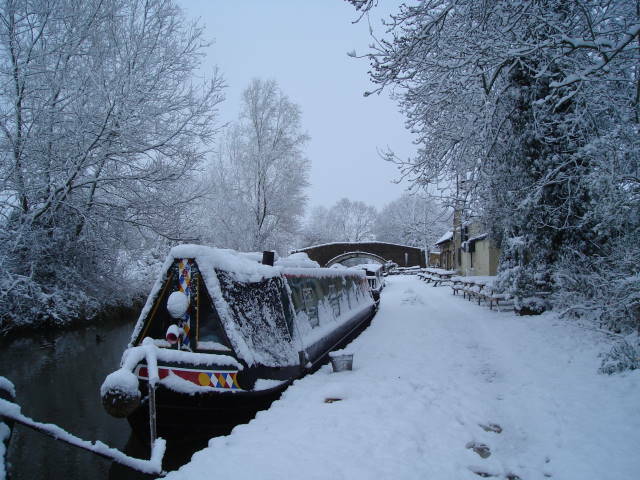 Karen was up to take photos for the calendar before it disappeared – so don’t be surprised to see a snow scene for April in next years calendar. This entry was posted on Sunday, April 6th, 2008 at 7:04 am and is filed under Uncategorized. You can follow any responses to this entry through the RSS 2.0 feed. You can leave a response, or trackback from your own site.